The building blocks of Angular Applications consists of Components, Templates, Directives, Pipes, and Services. We build a lot of such blocks to create the complete application. As the application grows bigger in size managing these blocks become difficult. The Angular Provides a nice way organize these blocks in a simple and effectively using Angular modules (Also known as ngModules). The Angular module (also known as ngModule) help us to organize the application parts into cohesive blocks of functionality. Each block is focused on providing a specific functionality or a feature. The Angular module must implement a specific feature. The Components, Directives, Services which implement such a feature, will become part of that Module. The Modular design helps to keep the Separation of concerns. Keep the features together. Makes it easy to maintain the code. Makes it easier to reuse the code. The Angular itself is built on the concept of Modules.The @angular/core is the main Angular module, which implements the Angular’s core functionality, low-level services, and utilities. The Features like Forms, HTTP and Routing are implemented as separate Feature modules such as FormsModule, HttpClientModule, and RouterModule. There are Many third-party libraries built around Angular such as such as Material Design, Ionic, etc. 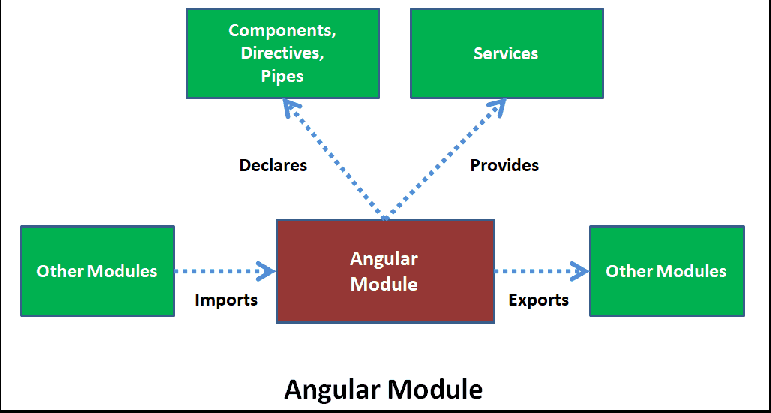 The Angular Module must declare the Components, Pipes and Directives it manages. We Create the Angular Modules by decorating it with the ngModule decorator. The NgModule() decorator is a function that takes a single metadata object, whose properties describe the module. The most important properties are as follows. This is where components, directives, and pipes that belong to this NgModule are declared. You should add only those, which belong to this module. The Component cannot belong to more than one module. The services must not be declared here. They are defined in the providers array. The Services, which you want to add to the global collection of services are added here. The services are then available for injection via dependency injection. Declarations is for Components, Directives & Pipes. If you want this ngModule require any feature or functionality, then those modules needs to be imported here. Any components, directives, and pipes that are defined and exported in that modules can be used in this module. If you want other modules to use the component, pipes, directives of this NgModule, then those must be specified here. Only those components declared here are visible to the other ngModules, when they import this module. The main component of this module, which needs to be loaded when the module is loaded is specified here. This is a must if you are the first module ( called the root module) that is loaded when the Angular App starts. It is the responsibility of the root module to load the first view and it is done by specifying the component here. The components that are dynamically loaded needs to be declared here. If your component is not listed any of the above, then it needs to be declared in EntryComponent so that it Angular knows where to find them and compile. Let us create an example application with multiple modules to demonstrate the use of the Angular Modules. Use npm start to run the program and test everything is ok.
No services are part of this Module, Hence providers array is also not needed. The Angular RouterModule is needed for the routing to work, Hence it is imported. The Routermodule requires the routes to work, hence it is passed to the RouterModule in the forRoot method. The application needs only one instance of the services provided by the RouterModule. But every Angular module might contain routes of its own and needs to import RouterModule and register the routes. The first module that gets loaded in called Root Module, which is conventionally named as AppModule and is automatically created by the Angular CLI. Let us add another Module to our above application. Let us add three components. HomeComponent, AboutUsComponent, ContactUsComponent. Create a folder called pages under the home folder. Create a three folder under pages aboutus, contactus & home. Next, use the declarations array to declare the three components that we have created. We are keeping the Routes in the module itself. You can create the separate routing module similar to the AppRoutingModule. That will help to keep the HomeModule code clean. HomeModule requires CommonModule hence it is added to the imports array. The RouterModule module is imported and routes are registered with the call to forChild(routes). forChild registeres the routes but does not registers any services. All we have done is to use the routerLink to create a menu item. In this tutorial, we learnt what is Angular Modules are and how to create an Angular Module.